This week I am pleased to be putting up an interview with one of the successful female Bartenders here in Los Angeles. If you find yourself in Downtown LA any time soon, I recommend you head in to Drago Centro (Review coming soon) and check out the bar program put together by Jaymee Mandeville. This vibrant and talented lady has created an interesting and well executed drinks list with unusual ingredients such as Dill Meringue and Squid Ink Syrup. Head in any night other than Tuesday or Sunday and you can enjoy a drink made by Jaymee herself. Where was the first bar you worked at, and what was your position there? At age 19 I worked as a beverage cart girl in college…. (they thought I was 21) so I made Manhattans at 6 am with mini-bottles of Martini Rossi and Jim Beam on the golf course. Who is/was your mentor? Who do you feel trained you in your area of expertise? Michael Shearin has been a huge inspiration to me in wine and spirits, and continues to be a close friend. Are you a fussy eater or picky drinker? If so, what WON’T you try? I don’t think so. I think I am open to trying anything. I just dislike all creamy salad dressings, most white condiments (i.e. mayonnaise, aioli, Alfredo sauce, hollandaise (to name a few)…..actually we should open it up to most condiments, ketchup, mustard, relish. 1000 dressing is my worst nightmare. Oh and I don’t like sweets…I don’t hate them, but I could definitely live without them. What is the most unusual dish or ingredient you’ve ever tasted? Worm salt (so weird, but surprisingly good, it tastes like sea salt and pepper combined.) I think Cari and I will be using it in one of our upcoming sangritas. What is your favorite “Classic” Drink/Cocktail? As a female bartender have you ever felt like you’re not being taken as seriously by the male dominating Cocktail community? Honestly, no, but I always welcome any challenge. I think the females in this city are very strong. We just started a LUPEC chapter here in LA and it has given me the opportunity to meet some amazing and talented females in our industry. If you couldn’t do what you do now, what would you do instead? Do you see yourself bartending forever or are there other career avenues you plan to explore? I feel that bartending is a great creative and social outlet, I don’t see myself doing it forever, but I do see myself using this skill set in many ways moving forward. I love traveling…if I could be like the jet-setter Angus Winchester, that would be amazing. If you would like to be considered for this segment of my site please send an email to pickydrinker@gmail.com with a little info on who you are and where you work. If you don’t sound like a crazy person, I will happily send you a questionnaire to fill out. If you work in Los Angeles I will almost certainly come in to see how good you are!Please note: I am looking for enthusiastic bartenders with a real passion for ‘Tending Bar”, Mixology or Classic drink making. Those of you who think ‘Sweet and Sour Mix’ is a great product, bartend only for the joy of extra cash and have no interest in the cocktail community itself, need not apply! 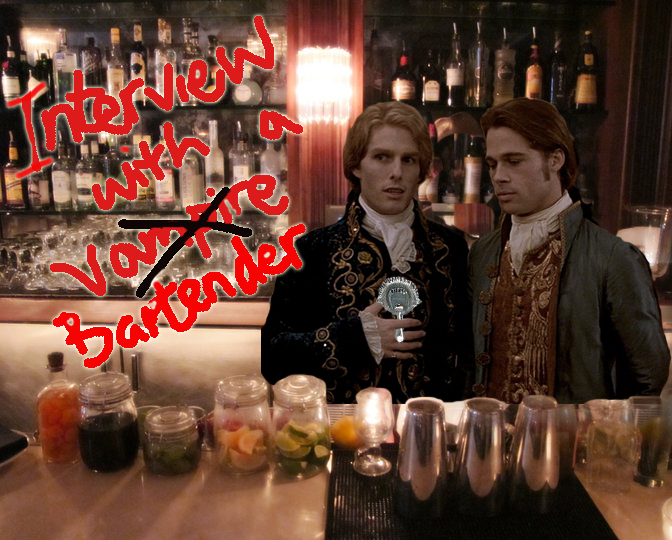 Filed under Interview with a bartender!